These points made by the Toronto Star in "Why lard's healthier than you think". And in terms of its fatty acids, it's better than butter: Lard is 60 per cent monounsaturated fat, which is associated with a decreased risk of heart disease. Butter is 45 per cent monounsaturated fat. Most of lard's monounsaturated fat is oleic acid, a heart-healthy essential fatty acid found in olive oil and associated with decreasing LDLs, thus lowering "bad" cholesterol. Lard contains about double the amount of oleic acid found in butter, says Nick Bellissimo, assistant professor in Ryerson University's Department of Nutrition. And this next one is from an Independent Online article "Lard: it's all about balance". And this next excerpt comes from Dr. Andrew Weil's Q&A "Is Lard Healthy?". Lard has always been prized as a cooking fat because it has a higher smoking point than other fats. For that reason, foods fried in lard absorb less grease. It also has the reputation of producing ultra-flaky pastry crust. Cans of lard are available in supermarkets, but most of these products have been hydrogenated so they'll last longer and are probably not what you want. The best lard is considered to be minimally processed "leaf lard" from the area around the pig's abdomen and kidneys or fatback lard from the pig's back. You can get these at high-end specialty markets or online. And finally, this excellent article from The Guardian "Consider Lard". 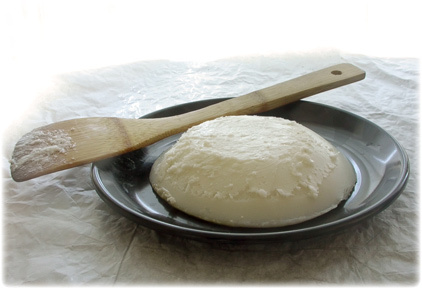 Before the second world war Britons ate lard without guilt or fear. Its disappearance from our kitchens parallels a surge in the national waistline and an upswing in the cosseted maladies of fat. It's worth remembering that the very people who so trumpeted the benefits of factory margarine – which we now know caused considerably more harm than good – were the same who lambasted lard and denied its natural glories. By any estimation, lard is a healthier fat than butter. Gram for gram, it contains 20% less saturated fat, and it's higher in the monounsaturated fats which seem to lower LDL cholesterol (the "bad" kind) and raise HDL (the "good"). It's one of nature's best sources of vitamin D. Unlike shortening it contains no trans fats, probably the most dangerous fats of all. Of course it has more saturated fat than olive oil, but in her splendid book Fat: An Appreciation of a Misunderstood Ingredient, Jennifer McLagan points out that even its saturated fat is believed to have a neutral effect on blood cholesterol. So there you have it. If you haven't got aboard the lard train, it's time you considered doing so - you can place your order here. It's a fantastic addition to healthy cooking, and it's delicious.